As much as I love using green and eco-friendly products, I also love using reusable shopping bags as often as I can. I think it’s great to use less plastic bags as possible or none at all. I was thrilled to receive the opportunity to work with Virescent on a review and was thrilled to write about them! They are a unique company where you can purchase their bags and sell them for what you would like to for your own eco-friendly fundraising! I think this is great for schools, companies and organizations because it’s not only a great fundrasing product, they are also eco-friendly and promotes using less plastic. 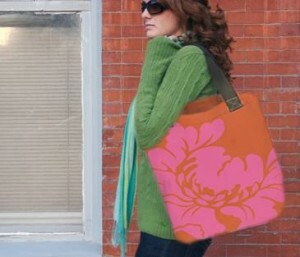 These bags also appeal to anyone with all the different designs and they don’t have to only be used for shopping! 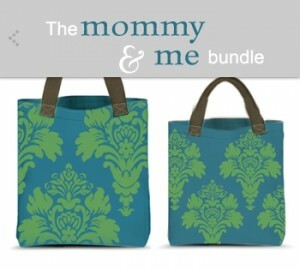 I was sent one of their Mommy & Me Bundles and we love them! You can get them in other styles too. Instead of the Como shown above, I received them in Honolooloo style. They are so cute too and like I said before, they are not only great for shopping but they are great for other things too such as using them as a tote when your heading to the beach this summer! 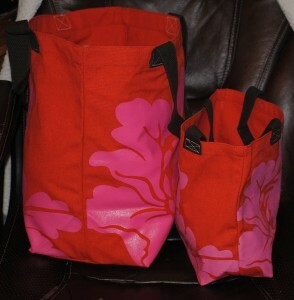 The larger bag is a whopping 18x16x6 inches and can hold the equivalent of two grocery bags full. The smaller bag is a 10 inch bag that matches. 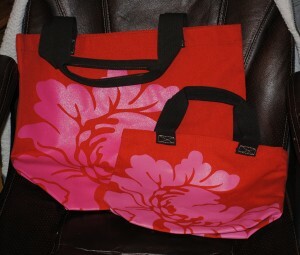 The handles are very durable and are long enough to carry comfortably over the shoulder. Another thing I love about this bag is that it is large enough to carry bigger items comfortably too! It also has a 5×5 inch pocket which allows for a handy carrying place for keys and such! My daughter thinks it’s really cool to have a bag like mine for those quick trips to store when she goes with me. Our kids have also used it to carry books with them when we go somewhere so they can read in the car. Want to know something else? Not only are they great for helping to save our environment from all those plastic bags, they are also made of organic cotton! “All of our Shoppers are grown, woven and sewn in the USA.” I still can’t get over how well these bags are made. They are GREAT quality bags, made really well and VERY durable. So cute and really stylish too! If you are planning a fundraising event soon for whatever reason, make sure to check out Virescent to get started with them! You can even have your bags of choice include your school, organization, or company logo on them! Virescent offers a great product for your fundraising. Visit their site to get started on your ec0-friendly fundraising event! Want to WIN one? Well, you can! I love the Paris bag…the colors are gorgeous! I love the sparkle blue bag. I couldn’t find other things that they offered on the site, just bags. But these look wonderful. I like the handmade glass marbles.